We offer Ladies Designer Cotton Kurti/Tunic,Casual Tunic,Exclusive Tunic.These Tunics can be worn on any occasion ranging from casual wear to formals and party collections. 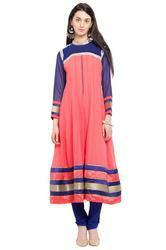 We are a leading manufacturer and supplier of Designer Kurti. Packaging Details: Standard International Packaging. Rama Green Kalidar Georgette Purple Contrast Sleeves And Rust Silk Detailing On Shoulder Around Half Body And Purple Embroidered Border In Hemline Kurti. Off White Red Black Three Toned Kalidar With Embroidered Borders On Neck And Hemline Brocade On Yoke. Coral Pink Peach And Royal Blue Kalidar With Hand Embroidery On Neckline And Empire Line . Designer Kurti to our valuable customers. Due to our large production capacity and well-equipped warehousing unit, these dresses are offered by us in bulk quantities. In fashion designer has shown the creativity and blend of eastern and western cuts in a elegant way. Designer has thrown few flawless designs on Indian Kurtis, Pakistani Kurtis, Western Tops and latest kurtis for girls to wear in official meetings, casual and other day wear events. Tops western dress , so now skinny, loose, baggy, funky and frocks tops, western style. As the fashion designers are very keen in recognizing fashion trends and they are bringing there collections match with latest style, Similarly Indian designer has brought of matchless series of Best western style Tops. Hot print in a bold stretch fabric, Fahrenheit is incredibly soft and comfortable; breathes to keep you cool in all-day competition. Terrific top to customize with your own crystals. This women’s western shirt from Cruel takes all of the western charm and adds to it to make a really unique piece you will love Whether you are riding in the arena, or wearing it with summer shorts, this is a shirt to reflect your fun and feminine style.